WheelEEZ® Wheels Are Superior - See the Difference! Home / Why WheelEEZ® Wheels Are Superior! Insist on WheelEEZ® And Here’s Why! Polyurethane (PU) tires featuring 100% USA made material. Available in 4 sizes. Polyurethane tires are stable in a wide temperature range: -15 to 75 C (5 to 167 F). 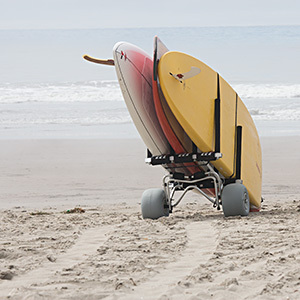 Roll effortlessly over soft sand, mud and turf. Equally superior performance on asphalt, concrete, gravel and rocks. Our tires include bike-style Schrader valves with caps, no problematic needle style valves. Stainless steel ball bearings reduce rolling resistance. Available in 2 sizes. Molybdenum enhanced bushings improve gliding. Available in 3 sizes. Replacement wheel parts are available if service is needed. No Other Wheels Do This! 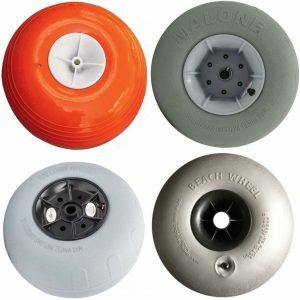 Wheeleez low-pressure balloon wheels flatten out soft sand. You can haul heavy loads over the sand effortlessly. Other wheels plow through the sand and dig ditches. VIDEO: Wheeleez wheels vs normal wheels. 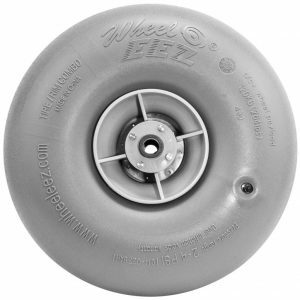 Wheeleez low-pressure balloon wheels are soft. 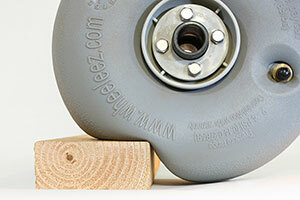 Wheeleez Wheels conform to almost any terrain. Wheeleez Balloon Wheels inflate to only 2-3 psi. VIDEO: Wheeleez Are Used Around the World.